Dresden (Germany) (AFP) – Eight members of a German far-right group face verdicts Wednesday after a year-long terrorism trial over a series of explosives attacks targeting refugees and anti-fascist activists. Based in Germany’s ex-communist east, the so-called “Freital group” had sought to create “a climate of fear” at the height of Germany’s refugee and migrant influx in 2015, prosecutors say. The seven men and one woman, now aged between 20 and 40, modified pyrotechnics they had bought in the neighbouring Czech Republic for five explosives attacks. One Syrian refugee was injured in a blast, and prosecutors charge that the group had casually accepted the risk of more victims and possible deaths in their attacks. If they are found guilty of forming a terrorist group, attempted murder and causing grievous bodily harm, prosecutors have demanded prison sentences of five to 11 years. Chief justice Thomas Fresemann was due to announce the verdicts and sentences at 1200 GMT. Defence lawyers have not disputed the attacks but reject the charge that they constitute terrorism or attempted murder, arguing instead that the bombings were “spontaneous”. 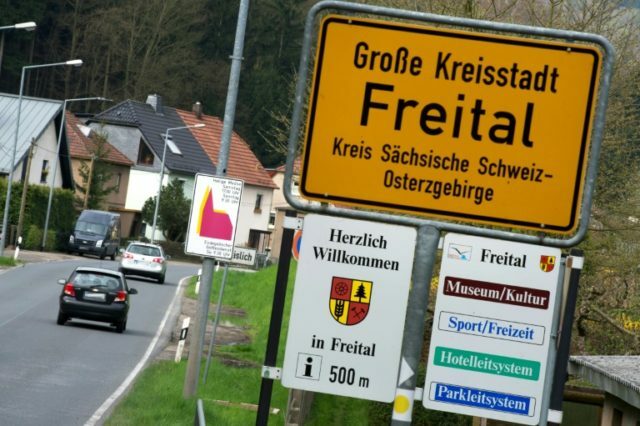 The Freital group is named after the members’ hometown, which drew notoriety beyond German borders in 2015 when enraged protesters there railed against “criminal foreigners” and “asylum-seeking pigs”. Nearby Dresden, capital of the eastern state of Saxony, was the birthplace of the anti-Islamic street movement Pegida, which has ties with the far-right Alternative for Germany (AfD) that has since entered Germany’s parliament. The trial has been held under tight security in a temporary courtroom complex with on-site holding cells located in a former refugee accommodation centre on the outskirts of Dresden. In the dock are the two suspected ringleaders — Patrick Festing, a pizza delivery and warehouse worker, and bus driver Timo Schulz — as well as five more men and one woman, Maria Kleinert. Prosecutors say they staged five attacks with explosives between July and November 2015 — two on Freital refugee homes, two on an office and a car of far-left Die Linke politicians, and one on a Dresden communal residential complex. A Syrian refugee suffered “multiple cuts” to the face when three explosive devices were hurled through the windows of a refugee housing centre on the night of October 31. On the final day of hearings in February, Festing apologised to the victims without however clearly distancing himself from far-right and racist ideology, reported regional newspaper Saechsische Zeitung. Schulz, who did not address the court, was previously handed a one-year suspended jail sentence for a baseball bat attack on the car of pro-refugee activists.